Sea Ranch is one of my favorite places in the world to run. I went out for a long morning run. Heading north, I ended running all the way to the end of Sea Ranch and into the Gualala River Park. It drizzled on me for about the first twenty minutes, but then actually cleared up. I came across several Sea Ranch historical markers that I have never seen before, including the Gualala Mill and the World War II bombing range. In total, I covered just under 9 miles. I will post a map in the next couple of weeks. Phil got back to the house just as I did. He had gone for a bike ride, but missed the turn on the way back and ended up going longer than he intended. After a late leisurely breakfast, we headed north on Highway 1. 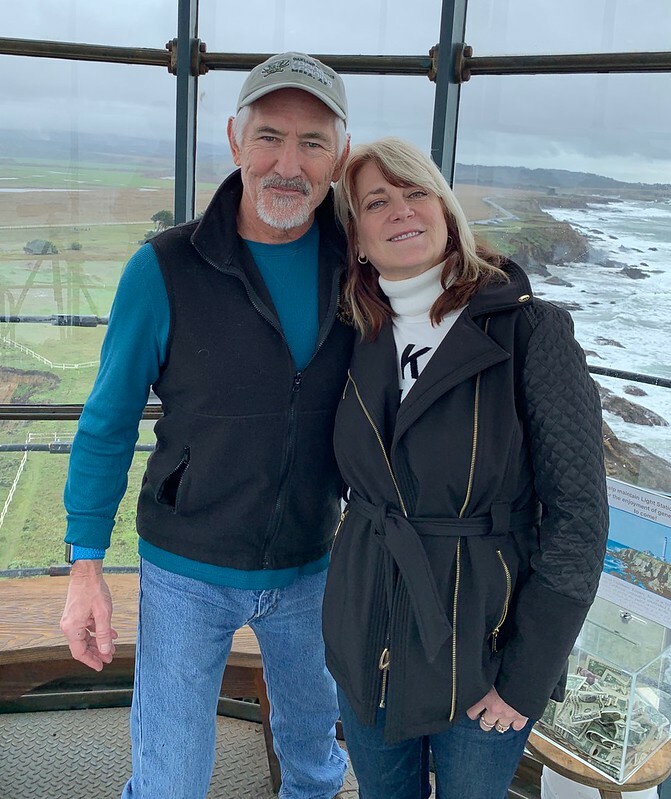 The plan for the day was to visit the Point Arena lighthouse, hike in the area and get a bite to eat at pier in Point Arena. We made a couple of brief stops in Point Arena and Manchester before heading out the peninsula to lighthouse. Sharon, Jack, Drew, Morgan and I actually visited the lighthouse in summer of 1999. It is the tallest lighthouse on the west coast and California Historical Landmark #1035. We listened to a short presentation in the museum and then climbed to the top. I am not a heights person, but I have to admit it was a cool view. Talking to the person at the desk, we decided to hike along the bluff in Point Arena-Storentta Public Lands. We hiked about 1.6 miles out and back. There were some expansive views. The rock formations and the colors of the cliffs were very different than Sea Ranch. We stopped at the Chowder House and Tap Room for a late lunch. We had some chowder and chili. I got a chance to watch part of the Saints versus Rams NFC Conference finals game. I think that the no-call on the pass interference at the end of the game is likely to fundamentally change the way instant replay is used. From there, we made a stop at the Vue Kitchen in Gualala. On the bluff over the Gualala River, this location has been a number of different names over the years. It wasn't open at all last year. I watched the beginning of the Patriots versus Chiefs AFC Championship game. We bought some steaks for dinner and headed back to the house. Sharon, Marlene and Phil lounged in the hot tub, while I watched the end of the Patriots versus Chiefs game. I also struggled to get the AppleTV working. I bought the oldest of the AppleTVs that I own and I couldn't get it to use multi-factor authentication. I had hoped that we would watch a movie [First Man?]. We finished the day with a late dinner. We ended visiting around the dining room table until almost midnight. I kicked myself several times over the course of the weekend. In the past, I have brought DVDs or hooked up an AppleTV so we could watches movies at night. It seemed to me that the inability to do this really changed the cadence of the weekend.